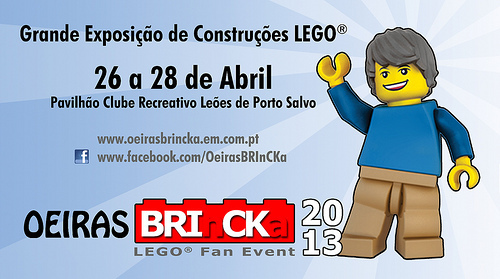 The Portuguese LEGO Users Group (PLUG) is hosting a LEGO show in Oeiras, Portugal this coming weekend, April 26-28. PLUG (Portuguese LUG) is going to run its annual, largest Lego fan event (Oeiras BRInKCa 2013) next weekend from April 26th through the 28th. The event will be in Oeiras, Portugal at Leões de Porto Salvo sport facilities, with over 1,200 square meters of exhibition and Lego-selling areas. You will have the opportunity to see models and dioramas from Portuguese and international builders, meet the new LEGO MINDSTORMS EV3 and enjoy several activities/workshops.